This customer does not exist on your MYOB - it means that the customer from Small Builders has not been saved to your MYOB account yet. Tick the checkbox of the contact you want, then click Integrate. 2. 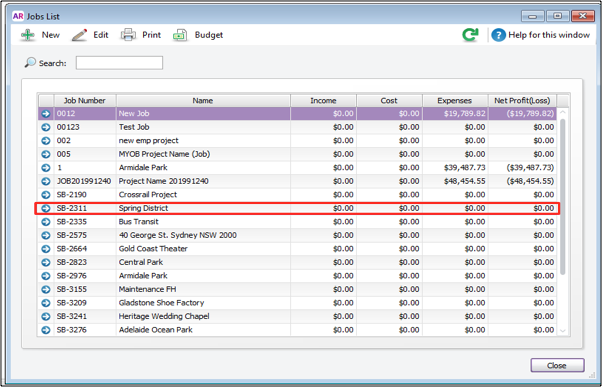 Transfer projects from Small Builders to MYOB. To do this, go to Management > Integration > MYOB > Projects> Register. You will notice that the customer is no longer highlighted in red. 3. Select which type of project you want to view and click View Record. There are three project types:Milestone / Lump Sum / Reference Date (Payment Claim System), Cost Plus/ Schedule of Rates (Cost Plus Payment Claim), and Do and Charge (General Payment Claim). 4. After selecting the type of records, tick the checkbox of the project you want to integrate then click Integrate. 5. o check if you did the integration correctly, go to your MYOB. Go to Jobs. All integrated projects will be displayed under Name.